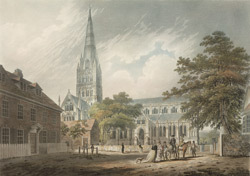 Daniel Defoe visited in the early-18th century, writing: "The cathedral is famous for the height of its spire ... yet the walls so exceedingly thin, that at the upper part of the spire upon a view made by the late Sir Christopher Wren, the wall was found to be less than five inches thick." Wren had ordered it to be strengthened with bands of iron plates. Defoe noted: "I have heard some of the best architects say, it is stronger now than when it was first built." This view also shows the circle of ground adjacent to the cathedral, known as the close.